How can we make cities more livable? Los Angeles, in particular, is a notably challenging place to live. For many, it is hard to see Los Angeles—city or county—as anything other than a huge, sprawling, and some would say placeless place. Los Angeles is known by many as the place that tore up more than 1,000 miles of streetcar lines to make way for millions of cars and hundreds of miles of freeways. Because of this, Los Angeles is also known for its poor air quality and jammed freeways. Those who live in Los Angeles know that it can be a very real challenge to get around. But Los Angeles is also a city of possibilities. It is one of the most culturally diverse cities in the world. It is mostly flat. It seldom rains. Surprisingly, Los Angeles has an alternative bike culture that has emerged and rapidly matured over the last nineteen years. It has gone from a rowdy and radical culture of bike messengers gathering for night rides to a substantial and growing community of riders, do-it-yourself bike mechanics, and homegrown transportation activists and advocates who have influenced the way bikes and riders are perceived and even how regional transportation policy is developed and implemented. How and why has that come to pass? In answering these questions, this dissertation seeks to describe the recent history of bike culture in Los Angeles through the eyes of its originators and ongoing participants. This is a narrative account of the recent past and the present in Los Angeles, California, in which a collection of bicycle-related phenomena appear to be transforming the land in ways that many might agree constitute a form of revitalization. The electronic version of this Dissertation is at Ohiolink ETDCenter, http://etd.ohiolink.edu and AURA, http://aura.antioch.edu/. An MP4 video introduction by the author accompanies this document. Donald Strauss, PhD, M.F.A. is the founding chair of the Urban Sustainability Master of Arts program at Antioch University Los Angeles [http://www.antiochla.edu/academics/ma-urban-sustainability]. The program launched in October 2010 with the intention of training practitioners and activists committed to working at the urban intersections of global environmental change and social, economic, and environmental justice. 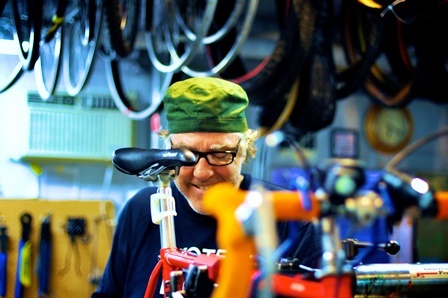 Strauss, Donald Parker, "Ridazz, Wrenches, and Wonks: A Revolution on Two Wheels Rolls Into Los Angeles" (2015). Dissertations & Theses. 194.